"I believe the public relation folks call it "forging a positive narrative"." 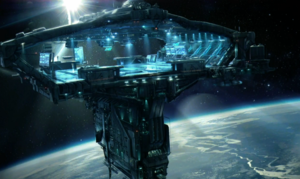 The Munera Platforms are orbital combat stations of the United Nations Space Command, created shortly after the activation of the SPARTAN-IV program. Sponsored by weapon and armor manufacturers, these stations allow corporations to analyze the raw data of their products, allowing them to better enhance their own product lines, while the UNSC leverages these events to train and hone Spartans during periods of relative peace. Munera Platforms exist across human-occupied space, at most naval depots and training facilities, though Earth and Mars currently have the largest numbers. One such platform is Munera Platform A7, located in orbit over Earth. While larger warships such as UNSC Infinity have extensive War Games facilities, most ships are not sizable enough to hold large exercises. Munera Platforms are designed to provide orbital training facilities for Spartans. Designed as a discrete, self-contained arena, Munera Platforms are capable of simulating a vast number of terrains and scenarios. Utilizing War Games technology, the platform can quickly generate any environmental schema using advanced holographic and hard light technology, allowing Spartans to display their martial skill and test the latest military technology. These stations can create simulations of any number of practical scenarios, though the most common simulations involve two fireteams facing-off in a symmetrical or semi-symmetrical arena. Combat orbitals have subsequently been utilized by all of branches of the UNSC Armed Forces, garnering a large internal following, creating cross-branch competition. Competitive Spartan exercises are publicly broadcasted to audiences across the Unified Earth Government in an effort to build morale and forge a positive narrative on Spartans. Munera referred to the creation of public works and entertainments for the aristocrats of Rome, similar to how exercises conducted on the Munera Platforms are broadcasted to the citizens of the Unified Earth Government. The Munera Platforms serve as the in-universe framing device for the Breakout multiplayer maps in Halo 5: Guardians. Concept blockout of the platform. Concept render of the platform.